There's more to the story for these Canadian marijuana stocks' gains -- or lack thereof -- in 2018. Mediocre, good, and great. That's how most people would probably characterize the stock performances for Aurora Cannabis (NYSE:ACB), Canopy Growth (NYSE:CGC), and Tilray (NASDAQ:TLRY) so far in 2018. And those are fitting descriptions. There's a long list of reasons why the three biggest Canadian marijuana producers have seen their stocks perform in very different ways. But share prices don't tell the full story. Here's why Aurora, Canopy, and Tilray have each enjoyed a better year in 2018 than you might think. Sure, all three of these big marijuana producers saw their revenue soar in 2018. Each of them scored some nice victories during the year. But that's not why they've had a better year than their share prices indicate. So what is the real reason? Take a look at the following chart. Aurora Cannabis' share price has fallen so far in 2018, but its market cap has soared. 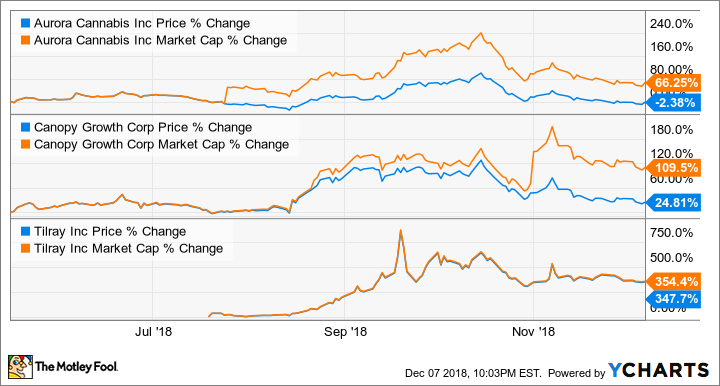 Canopy Growth's solid year-to-date share gain would have been spectacular if it had kept pace with its market cap gain. Tilray's share price and market cap gains aren't too far apart, but investors would still have loved to squeeze out another 7% increase. Both Aurora Cannabis and Canopy Growth experienced dramatic growth in their numbers of shares outstanding. Tilray's shares outstanding increased, but only by a small amount. That explains why the company's share price increase and market cap increase were much closer compared to the respective increases for Aurora and Canopy. Aurora Cannabis and Canopy Growth issued a lot of new shares during 2018 to raise additional cash. Tilray didn't do so. However, the main reason why Tilray didn't need to raise more capital is that the company conducted its initial public offering (IPO) in July and is still riding off the cash generated from that initial offering. In January, Aurora announced a bought-deal financing transaction of 200 million in Canadian dollars. In March, the company completed another CA$230 million convertible debenture offering. In October, Aurora announced the conversion of all 6% unsecured convertible debentures due Nov. 28, 2022, into more than 265,000 common shares. Canopy Growth started the year with a CA$175 million bought-deal financing transaction. The amount of the deal was subsequently increased to more than CA$200 million. What became of all the money that was raised? It was primarily spent on acquisitions and adding production capacity. But some was also needed to pay the bills, since neither Aurora nor Canopy has been consistently profitable. Aurora Cannabis provides an interesting case study of the wisdom of using dilution-causing stock offerings to grow rapidly. Aurora is, without question, a much different company than it was on Jan. 1, 2018, as a result of a series of acquisitions that wouldn't have been possible without issuing more stock. But there are two views on this. 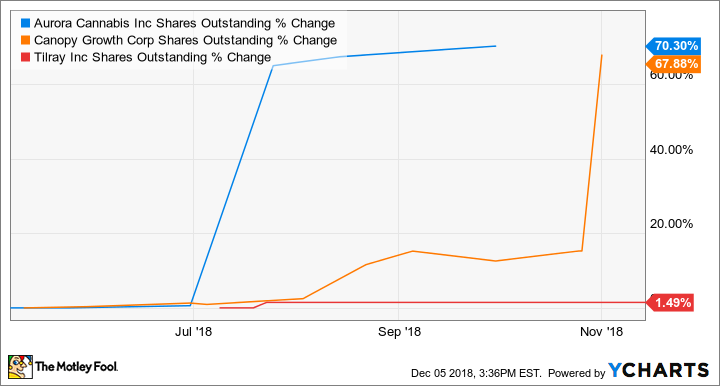 My Motley Fool colleague Sean Williams expressed his opinion a few months ago that Aurora is "blatantly disregarding shareholder value with its acquisitions." Aurora Chief Corporate Officer Cam Battley, on the other hand, said in June that Aurora is in the middle of what is "essentially a land grab." The company views its frantic acquisition activity as a must to catch up with others in the industry. Whatever you think about the flurry of bought-deal financing transactions, the dilution resulting from those deals is now water under the bridge, right? Not necessarily. Aurora Cannabis, Canopy Growth, and Tilray have offered convertible debentures and convertible notes to raise money. These start off as loans but can be converted to stock down the road. That means there's a good chance that more dilution could be on the way. With the possibility that the U.S. might legalize hemp (which by definition is cannabis with very low levels of THC) in the near future, all three of the big Canadian marijuana producers could go on another shopping spree to expand into the U.S. market. That could mean even more dilution for some of these companies, although they could fund additional acquisitions through borrowing. Canopy Growth is the least likely of the big three to need to go to the well again by issuing stock. Thanks to a $4 billion investment from major alcoholic beverage maker Constellation Brands, Canopy is sitting on a nice stockpile of cash. It's possible that the sacrifice of share price gains in 2018 could pay off for investors down the road if these companies dominate the global cannabis market as a result of their stock-fueled deal making. And there's a solid argument to be made that at least some of the share gains resulted from investors' excitement about key acquisitions. But especially for Aurora and Canopy shareholders, seeing how great 2018 might have been could be a little frustrating.